We admit from the start: we couldn’t tell you how many deadlines were passed with this stadium, because it was initially expected to end back in 2009. Through these years we only informed about major delays and so we are today. 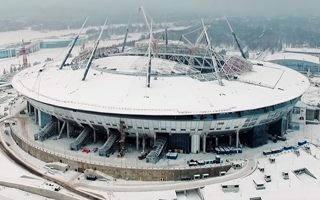 There is one more, most likely last slip at Zenit Arena. General contractor Transstroi was expected to finish work on December 31, 2015. Should the investor begin charging penalties, the construction giant could have been facing over 700 billion rubles ($10 million) of fines. But instead, public authorities annexed the contract and gave Transstroi six more months, ending on June 30. No fines will be paid and this seems fair as this time delays were caused by the bankruptcy of a crucial subcontractor delivering the retractable roof, Mostootryad-19. To date only 4 segments of the retractable roof were mounted on top of the stadium, while there should already be all 12. They will all eventually be assembled to create two segments resting atop the southern and northern ends of the stadium. Each shell will weigh 1,000 tons and be moved on 14 carts. All of the carts will be in place by late March, while the roof cover will be complete a month later. Other works are much more advanced and according to latest report by Transstroi the overall progress stands at 82%. The outer cladding is slightly ahead with 84%. Most seats are already in place, while works inside the stadium’s future facilities are in full swing thanks to permanent heating being launched in November. After delivery in early summer of 2016, the stadium will undergo a rather lengthy launch into operation. But there’s no risk of being late for either the 2017 Confederations Cup or 2018 World Cup.